The Liberal government is raising the threshold on emissions for its planned carbon tax after hearing concerns from Canadian industry. The Liberal government is curtailing its plan to price carbon pollution after hearing concerns from Canadian industry officials about how the tax would affect their ability to compete. 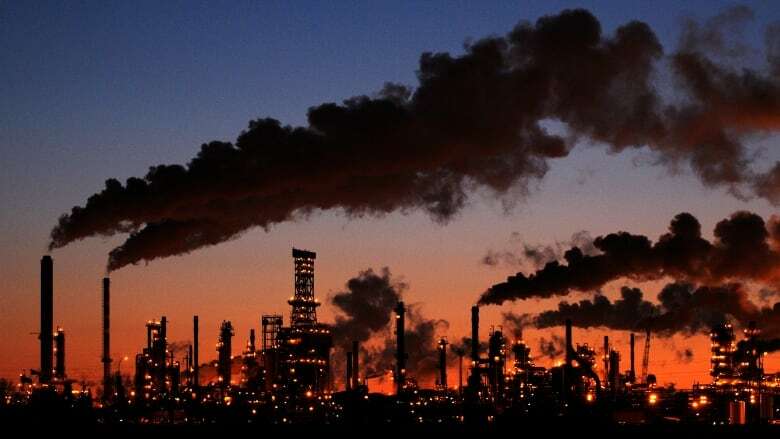 As the Globe and Mail first reported Wednesday morning, Environment and Climate Change Canada plans to release new guidelines that lower the percentage of emissions on which some polluters will have to pay the carbon tax. The decision to raise the cutoff point for carbon taxes will have the biggest impact on companies that are already more efficient than the industry average, or are close to the average. They should see their tax bill decline substantially, and some of the most efficient could find themselves paying no carbon tax at all. The worst polluters, whose emissions far exceed the average in their industries, will see their carbon tax liability shrink too, but their tax savings will be proportionately much smaller. Back in January, Environment Minister Catherine McKenna set the benchmark at 70 per cent of an industry's average emissions performance, meaning companies would have to pay a tax on emissions they produced in excess of that benchmark. McKenna's office confirmed to CBC News that they've adjusted the proposal to set the benchmark at 80 per cent of the industry average of emissions — and 90 per cent for producers of cement, iron and steel, lime and nitrogen fertilizer. Emissions produced beyond that point would still be subject to the tax. McKenna said today it's important to make big polluters pay, and that it will force them to reduce emissions and innovate. "But we have to do it in a smart way," she said during a visit to the Gaspésie region of Quebec. "I've always said the environment and economy go together, and we don't want to drive industry out of our country. "We want to have the most energy-efficient, smart industries here that create good jobs (and) at the same time do what we need to do to tackle emissions. And that's exactly what we're doing." The move was not welcomed by environmentalists. The David Suzuki Foundation issued a statement saying it undermines carbon pricing and "put(s) industry and citizen progress on climate action at risk." "It's a disappointment not just for groups like Greenpeace, but I think it should be a disappointment for every Canadian," said Keith Stewart, head of Greenpeace Canada's climate and energy campaign. "If we are slowing down our climate plan, if we are not going to reach the commitments that we promised we would take to change our economy, then we all pay that price." NDP MP Peter Julian said the decision means that Canada won't be able to meet its climate commitments under the 2015 Paris accord. "The capitulation to Doug Ford this week means, essentially, that Canada will not be playing the role it needs to play in climate change leadership so that we can mitigate the impacts of climate change," he said. "This is a flawed policy. This carbon tax policy does not have any substantial environmental outcomes but it does have severe impacts to our economy, and you are seeing the federal government starting to admit that that truly is the case," he told guest host Catherine Cullen. Moe said he wants the federal government to develop a climate plan with his province that takes into consideration Saskatchewan's resource-based economy, rather than imposing a made-in-Ottawa plan. "We're happy that Justin Trudeau is flip-flopping and acknowledging what we have said all along, that higher carbon taxes will drive jobs and money out of Canada and into other jurisdictions that don't have carbon taxes," said Conservative MP Pierre Poilievre. Chris Ragan is the chair of Canada's Ecofiscal Commission, which supports a carbon tax as a market-based way to reduce carbon emissions. He said the change in the plan announced Wednesday was more of a tweak than a watering-down. "I think what we've got here is a pretty small adjustment in what is often called the federal backstop plan, and it's a small adjustment that really is driven by concerns about business competitiveness," he told Cullen. "And I think those concerns are quite legitimate and we have been talking about them for quite some time,"
In one of his first moves as Ontario's new premier, Doug Ford announced the province would be getting out of the cap-and-trade system and vowed to go to court, along with Saskatchewan, to fight Ottawa's carbon-tax plan.